Yesterday (Thursday), after shopping for supplies and before going to the station to give out aid the volunteers from Studenicani took us to the mountains near the border of Kosovo and Albania for a farewell meal for Ch Faisal Raza. We leave for Serbia tomorrow to help in the Belgrade parks and he had been like family with them in this crisis for the last month, and built great relations to allow us to freely help there. It’s great the other team from the UK is here to take over now and Ziko is showing them all the shops today for the supplies. To be honest it was far away from Skopje, I was a little apprehensive as its been the area of ethnic clashes in the past and was were many people fled during the Kosovo war, and I think scenes of conflict in 2001 Macedonian war. The restaurant was lovely, very high in the hills it was really nice and the food great. I’d like to have seen the panaroma in the day too of the valley/mountains. I think it’s called Polog valley. They kill the fish from the nearby lake that they keep there and when someone orders they go out pick one and whack it on the head and bring it to show you before you eat, I found this process intriguing (see picture in gallery) despite being vegetarian. I ate so much I nearly blew up!! It was a very kind gesture of them I was very thankful and full :)) There were lots of stuffed mountain animals on display, some are now protected. 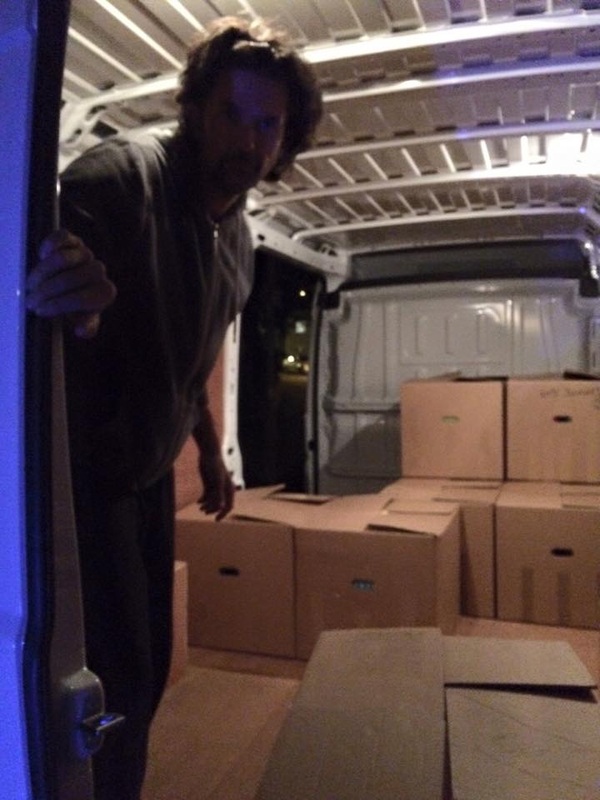 We travelled back to the warehouse in Studenicani and sorted and loaded some more and arrived back to Tabanovtse around 11pm. Helped unload the food packs, where they also put all our toothbrush and toothpastes into them. We walked with some people, who we’d given torches to, to the Serbia border (you’re not supposed to cross as its illegal…so I’ll let you decide what we did rather than say it) some parts were still muddy. In the rain I hear everyone has been slipping and dropping their babies, just awful scenes, and I have to say I am glad I haven’t had to witness this as I’m not sure how I’d cope seeing this given that I’ve never been in this situation before so am gradually adjusting. We walked back and Faz brought the van to the main tables by the campfire tonight where most refugees congregate when they get off the train as the soup and food station is to the right of these tables. 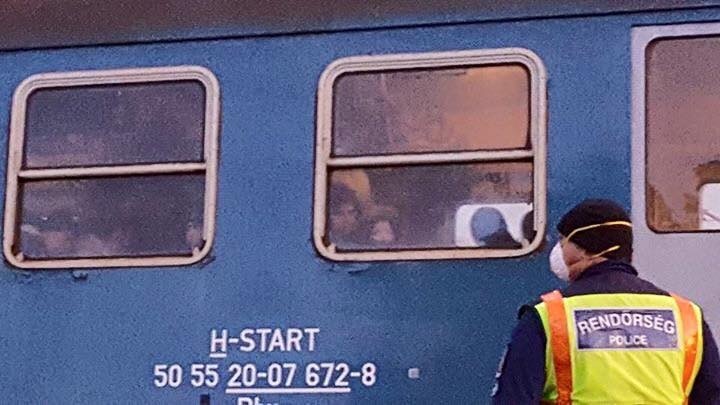 Then we heard the next train wasn’t due till 5am so I sorted boxes of clothes inside but then refugees began arriving by bus and taxis from Gevgelija camp. So there was a steady stream of people then until the train came and it was chaos, so so many people and we ran out of most things. Luckily every child got a hat and gloves just adult hats and gloves ran out. 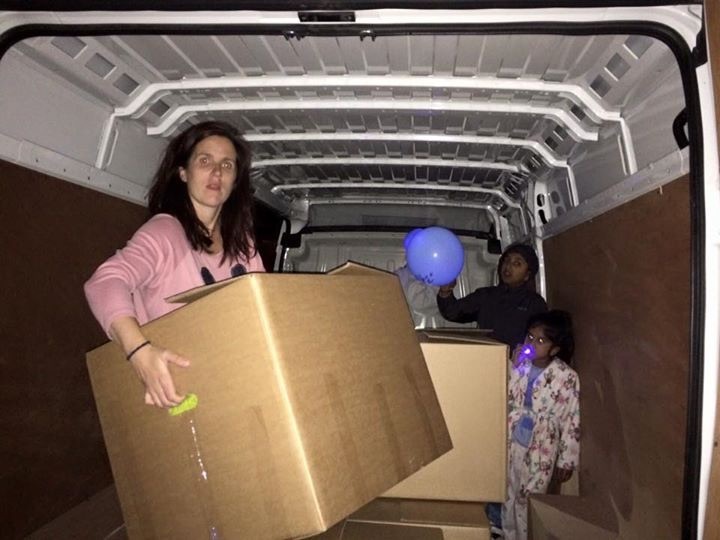 You could fill a whole van with hats and gloves alone to assist. When I looked up and realised it was getting light and it was morning. My body ached and eyes strained and everything but I think we helped as many people as we could.This was when we spoke to the very well to do looking Iraqi guy with the two pregnant women, kids and two injured people…I really hope the Red Cross helped them this morning. I’m not going to make any political type statements on here about organisations and what I see and hear so if anyone wants to ask me when I’m back where I think help is best directed I am happy to speak to you. Then on to Skopje and spinach and cheese pancake for breakfast and a wee. I’d eaten a bread roll and a yoghurt during the night which kept me warmed up! We will go to the shoe factory today and get loads of shoes. 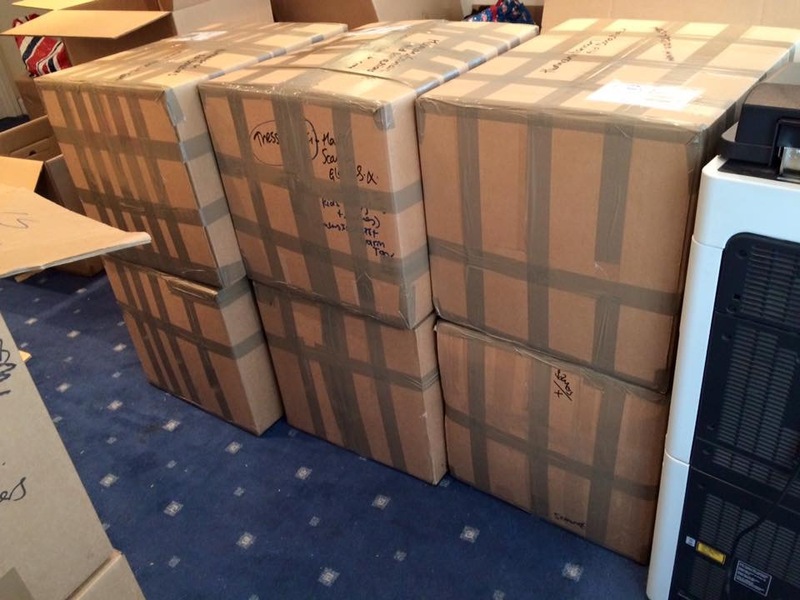 And the UK team has gone out to get all the hats, scarves, gloves, kids hats, trousers and jackets. We are then off to sort it all at the warehouse in Studenicani (they called it the ‘magazine’ like it sounds like the French ‘magasin’ for shop) and then off to the station again. I’ve just got back, we finished at 6.30am and a new group from the UK had arrived too that Shazia had met in Slovenia, so we went into Skopje and had breakfast and a tea. Now my eyes are falling out. We gave out all the hats and gloves and kids hats and other stuff I bought yesterday, in fact we ran out which was bit frustrating! I spoke to a lot of families today some from Syria, some from Iraq and some from Afghanistan. It got really cold tonight. I walked the walk they do to the Serbian border parallel to the railway line, in the dark to see it where the Serbian police are stationed. I have had one of the weirdest 24 hours. Lots of babies and kids, and a man in a wheelchair with some friends, we gave him a blanket and they had to push him across really uneven mud path in the dark. I dressed alot of kids and babies in coats too today, so now I sort of know how the whole set up works. I locked myself in the van too which luckily came to a swift end! As we left a man came up to us to ask how they get to Serbia. We explained it’s a 10km walk or they can wait til later on morning from 10am and walk part way to the middle village where a UNHCR bus takes them on to Presevo to wait to register into Serbia. He explained he was from Iraq and with 2 pregnant women, children, an adult with broken hand and another broken leg. I had no idea what to say, I can’t even imagine! We suggested they wait until the Red Cross re-open and go to their tent so they can assist with maybe wheelchair, and arrange for Red Cross to maybe get them at the other side. Until a while ago people were being robbed here by people hiding in the bushes which made me feel quite scared but they’ve gone now thanks to some local intervention shall we say. I met an afghan boy whose boat filled with water off Kos and they all survived but he had to slap everyone to stop them being in shock state. He said he’ll add me on Facebook and let me know how he goes. It’s 6.15am and we got back 15 mins ago. Yesterday we bought supplies from your kind donations and then we headed to the spedition company, Bomi 10, to wait for the van to be released. Then it was on to Studenicani to a workshop owned by one of the volunteers to unload and pack up today’s supplies and lots of stuff from van (having checked what it all was). We stopped at a cafe with some of the Albanian team who have been volunteering for months helping people (and working every day too in their usual jobs!!!) then drove to airport to return the hire car. After some food we drove to tabanovste in thick eery fog and soon after the train arrived. This was at just before 11pm. 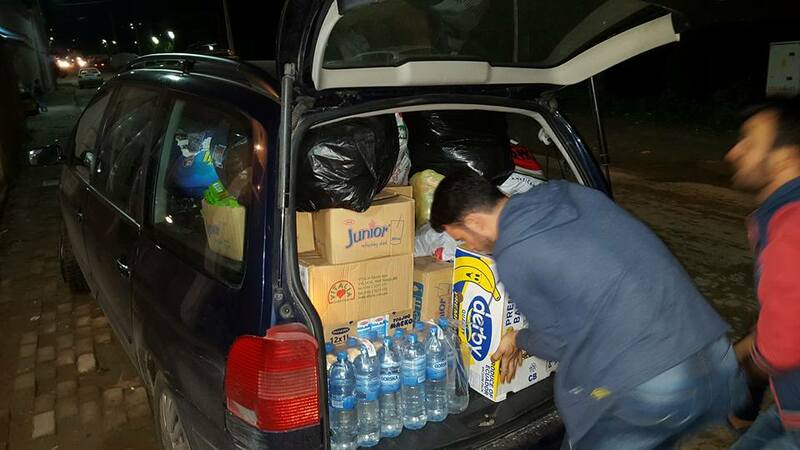 It was non stop til 6am as taxis and buses also bought many Syrians, Iraqis and afghans from Gevgeliga camp. We ran out of gloves and hats for adults. All the shoes went. 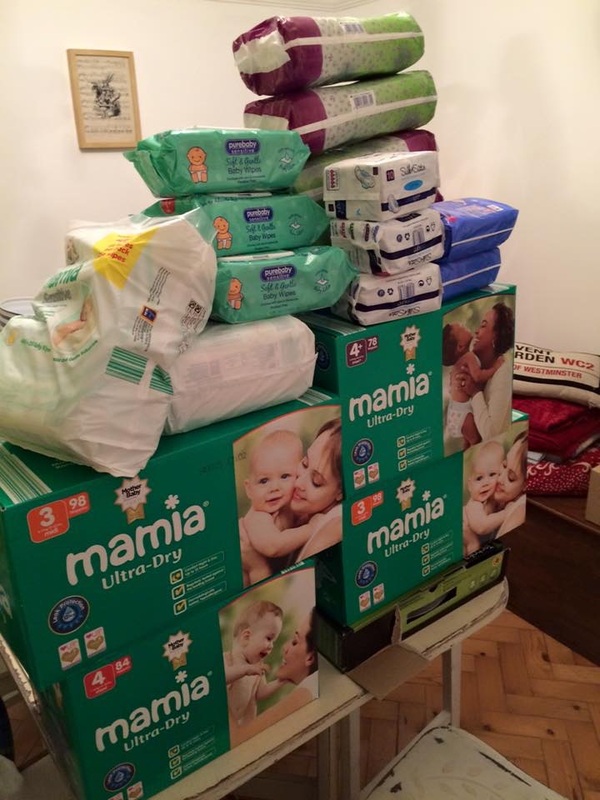 We clothed a lot of babies and gave their mums nappies and stuff to keep them warm. I gave my hat to someone, I gave Sunny’s hat (which reminds me of him being little) to a boy travelling with a relative but no mum…we asked…she’s dead. Twins of one month old came through and I decided I couldn’t go along to see the Serbia border route as I felt I would break down in tears seeing the parents and these twins walking in cold and dark in these circumstances. 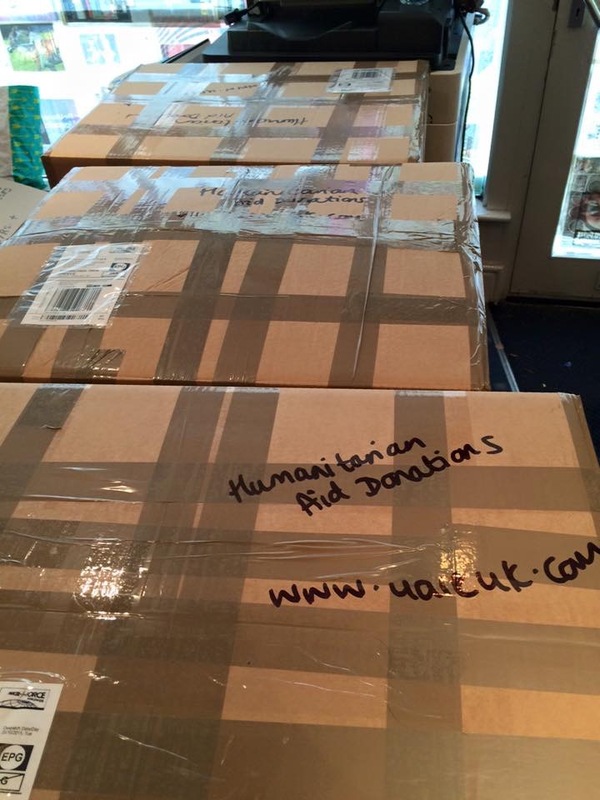 So so many people are desperate for gloves, hats, scarves, warm jogging trousers and shoes. Tomorrow our group is funding the soups, well 600 of them for one night train shift, and we will also go to local shoe factory to buy stuff. All I can say is that the volunteers here are brilliant, selfless and welcoming. They even give the shoes off their feet to refugees, they put half their wages to funding aid in some cases and they are even preparing a team to clear path through snow when it comes. Argon from ogranok na MIHO who vouched for the aid being humanitarian to customs came down for distributing aid, they are a charity of a Saudi Arabian relief organisation, I am so glad they agreed to vouch for it!! By around 10am on Wednesday morning I’d had £1235 donated with more being pledged, I’m gobsmacked! Thank you all so much. The day was spent shopping (£445 spent today for supplies) and collecting the van. We finally have the van!!! Freed after 1 month!! Much of the afternoon was spent sorting it out, it was amazing to be able to hand out donations that I actually saw being put in boxes at our sorting hub in Wrexham!!! After we finished we came back here to eat, and will now head back to Tabanovtse to wait for two trains, due in around 11.30 and 1.30am ish. 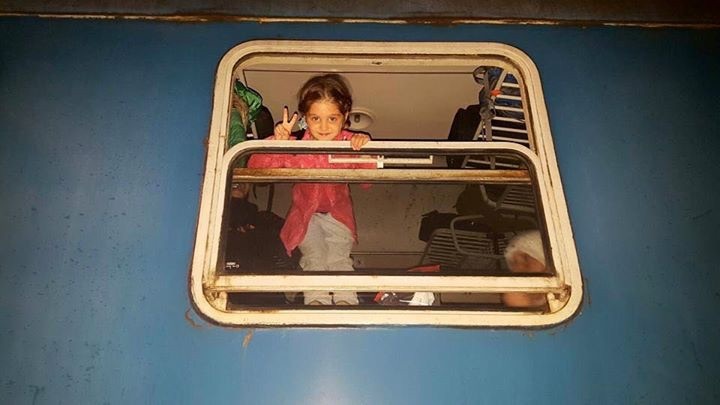 We left Skopje airport at about quarter past midnight and headed straight to Tabanovtse station where the refugee train arrived around 1am. After a quick look at the set up here we were told the train was coming and I was tasked with getting the breads onto the soups with the long term volunteers for all the people warming up with soup before they set off for the border with Serbia … Bearing in mind they don’t know what their journey is next until the volunteers explain to them. Seeing babies and kids cold and in this situation is very very very sad. They’ve got no idea what’s going on, they should be in a warm bed. We got back ay 4am in Skopje after dropping another volunteer home to kumonovo, I’m having a cup of tea and I’m now in my pjs writing this. I’ve given out most of what was in my suitcase and will sort what’s left tomorrow. Everyone was desperate tonight for hats, gloves and scarves. I’ll go shopping tomorrow, so please if you can spare some funds there are so many people without hats gloves and scarves and babies too. Today I saw first hand what’s happening. 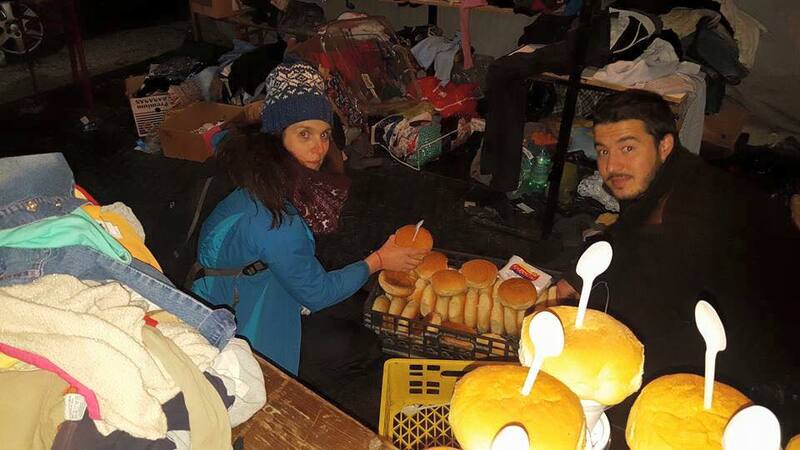 Some people have a soup and grab maybe a hat or something for the kids and then head off to walk 10km to Serbia. Some people try sleep in the tents there to get rest. I went in and met people in there and gave some shoes, hats to the kids and babies, gloves and other bits. Our blanket appeal has done it!! 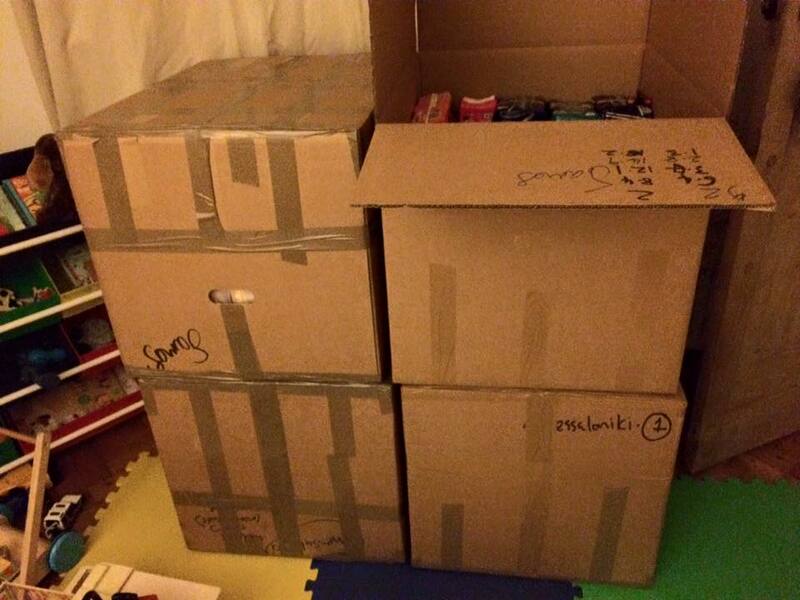 Last night with a mega donation from Saughall Toddler group and some other super donations we reached our target to fund 5000 emergency foil blankets for refugees.